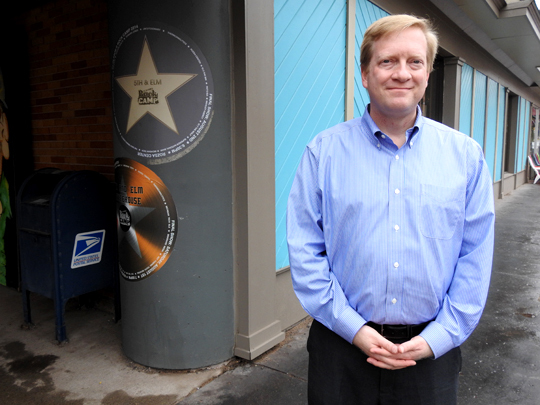 Garrett Neese/Daily Mining Gazette Sam Bagenstos, a Democratic-endorsed candidate for the Michigan Supreme Court, is seen outside 5th and Elm in Houghton Saturday. Bagenstos is campaigning and stressing the role the court plays in residents’ daily lives. HOUGHTON — Sam Bagenstos has some hurdles to overcome in talking to voters about his Michigan Supreme Court candidacy. Not his views, or his background — civil rights lawyer, Department of justice appointee under Barack Obama — or his views. More basic than that. Such as: Michigan has a Supreme Court? And we vote for it? It does, and we do. Bagenstos, who is on the November ballot as a Democratic-endorsed candidate, was in Houghton Saturday to campaign and to talk about the court’s importance to Michiganders. The state Supreme Court decides issues with everyday impact, Bagenstos said, such as consumer protections, workplace rights or environmental regulations. Bagenstos said the court has gained a new importance with President Donald Trump’s success in getting large numbers of young, ideological judges into federal posts. Bagenstos said his background as a civil rights lawyer brings something different to the court, where people have come other from judgeships or from the administration of the governor who appointed them. He’s also experienced in appellate court, he said, having supervised appellate work with the Department of Justice and arguing four cases at the U.S. Supreme Court. Along with two unanimous wins, he also won 6-3 when Chief Justice John Roberts and Justice Samuel Alito joined the court’s liberals. “I try to get inside their heads and their hearts and figure out what’s making them tick and what kinds of arguments will appeal to them so that we’re not just having a conversation that’s shouting across a divide, but we’re having a conversation that engages each other,” Bagenstos said. In courts now, the prevailing view is of law as an abstract “linguistic game,” Bagenstos said. Instead, he tries to figure out what the people who adopted the law tried to accomplish. “I’ve spent a lot of time as a lawyer making arguments based on statutory text, but I think the better way to decide cases is to understand that as the starting point, not the ending point, and to be thinking of law as a human endeavor,” he said. Though political parties place candidates on the ballot, they’re on the nonpartisan section of the ticket, where straight-ticket ballots won’t register a vote. Bagenstos reminded people to vote downballot. “If they don’t, then the decision of who’s going to be controlling one of the three branches of government — and probably the branch that has the most significant day-to-day impact on people’s lives in lots of areas — is going to be left to other people,” he said.